We highly recommend that you read through this page as well as the FAQ before placing your order. If you have any questions, please do not hesitate to contact us. We will reply as soon as possible. After you've read through this page and the FAQ, please also take a look through the Gallery pages and browse through our samples, borders, art, fonts, and photos. These will help you get an idea of what you'd like for your own custom sign. Since we cannot list everything that we have in our database, please feel free to contact us if you want anything custom. 1. The first step in creating your sign is picking the border. We have a variety of borders available. Take note of the size, the type/category, and the "name" of the border that you like. The size and style of the board will affect the price. For example, you might like a size 7" x 18" arched border shape in the "Edwards" style - totaling $44 without any artwork. A size 9" x 18" board in the same shape and style would be $53. Please note that not all of our borders are available in every size. If you don't see a particular border style listed under the size you want, we may still be able to convert it to that size. If that's the case, please contact us about it. 2. E-mail us the name/number and size of the border that you'd like for your sign. Let us know everything that you want written on your sign and any of your preferred lettering styles. (TIP: Usually it is best to limit your sign to just one or two fonts.) We do not charge per letter. However, remember that the more text you want on a smaller sign, the smaller the text will be and the harder it will be to read from a distance. If you're not sure of an exact font but know that you want something in cursive or western lettering, for example, you can put that instead; we will send you scaled-down proofs using different fonts in the style(s) you selected. If you don't suggest any fonts, we will use our best judgement when sending you layouts to choose from. If you want a custom font, let us know. 3. If you want art on your sign, browse through the Art pages and find the artwork that you want. It's usually best if you limit the art to one or two image(s) per sign. The price of the artwork depends on the level of complexity. For example, simple silhouettes/outlines cost $5.00. Complex silhouettes/outlines and simple colored artwork cost $10.00. Outlines with lots of detail and more complex colored artwork cost $15.00. Extremely detailed artwork can cost from $20.00 to $25.00. All three-dimensional artwork costs $25.00. Once you have selected the artwork you want, take note of the price and the item description (the name and number listed underneath the photo - e.g. 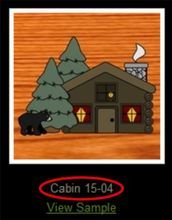 "Cabin 15-04"). 4. In your e-mail, paste or type the item description(s) (the name and number - e.g. Golf 10-02) of the image(s) that you want. If you want a custom image that you do not see listed on the website, just let us know what you'd like. 5. If you'd like, you can select one of our two hanging options for your new sign. You can either have us put a keyhole slot on the back of your sign for hanging against a wall (an additional $2 per slot), or you can select the eye-hooks & chain option ($3), which is useful in temporarily hanging a sign (while camping, for instance). Just let us know which option you'd like. This is not mandatory. If you'd prefer to hang your sign another way, feel free to skip this step. 6. You can calculate an estimate of your order total using the prices listed on the website. Additional tax and shipping may apply. In that case, we will let you know the total charge when we finalize your order. 7. Once we receive your order, we will e-mail you within a couple of days with a layout for you to approve before we create your custom sign (we might also give you other options to choose from). If you want to alter the position of anything, correct the spelling of a name, or change the color of an image, you will have the opportunity to e-mail us back and describe what you want to change. After you approve the proof, we will begin to make your sign, and we will have it shipped out within a week or so (depending on how many orders we have in front of yours).